This force is proportional to the product of masses of the objects and inversely proportional to the square of the distance between them. It is independent of medium. Eg If a body is dropped from a certain height, it falls downwards due to earth’s gravity. If a body is thrown upwards, it reaches a certain height and then falls downwards due to the earth’s gravity. • Gravitation may be the attraction between objects in outer space. It holds stars together . . .
And binds galaxies together for billions of years ….Prevents Planets from losing their atmospheres. When we move from the poles to the equator. Hence, the value of g decreases. Why? What is the difference between gravity and gravitation? How far apart they are. of the bodies, and inversely proportional to the distance between them? The acceleration due to gravity is denoted by g.
From the second law of motion, force is the product of mass and acceleration. For free fall, force is the product of mass and acceleration	due to gravity. Calculate the value of g on the surface of earth. What is the difference between “weight” and “mass”? Mass is a fundamental, universal property. You have the same amount of mass no matter where you are in the Universe. Weight is not fundamental its value depends on circumstances in the Universe. Weight is a force. It is the resultant gravitational force exerted on a body with mass m by all the other bodies on the Universe. Weight = Fg = G m Me / R2 = mg where Me is the mass of the Earth and R is the radius of the Earth. The mass of the moon is less than the mass of the earth. So the moon exerts lesser force on the objects than the earth. The weight of an object	on the moon is one sixth (1/6th) of its weight on the earth. object and the weight of an object on the moon is the force with which the moon attracts the object. What will be the weight of the body on the moon whose mass is12 kg? Thrust is the force acting on an object perpendicular to the surface. The SI unit of thrust is N/m2 or N m-2 . It is called Pascal (Pa). Pressure exerted on fluids is transmitted equally in all directions. 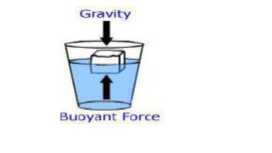 When an object is immersed in a fluid it experiences an upward force called buoyant force. This property is called buoyancy or upthrust. Why objects float or sink when placed on the surface of water? Take some water in a beaker. Take a piece of cork and an iron nail of the same mass. Place them on the water. The cork floats and the nail sinks. If the density of an object is less than the density of a liquid, it will float on the liquid and if the density of an object is more than the density of a liquid, it will sink in the liquid. The relative density of a substance is the ratio of the density of a substance to the density of water. It is a ratio of similar quantities and has no unit. Explain what Centrifugal force is. What do you mean by the weight of the body on moon. Give the value of G with proper units. What is measured by physical balance? At what height above the earth’s surface would the value of acceleration due to gravity be half of what it is on the surface? Take radius of earth to be R.
2 . A body of 90 kg f on the surface of earth. How much will it weigh on the surface of moon whose mass is 1/9 and radius is V of that of earth? A piece of paper takes much longer to fall than a stone through the same distance. Explain the reason. Why gravitational force is usually unnoticeable? Prove that acceleration due to gravity is independent of mass of the body. 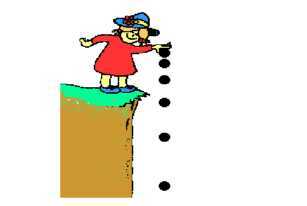 How can the average density of the earth can be determined? Find the percentage change in the weight of a body when it is taken from equator to poles. The polar radius is 6,357 Km and equatorial radius is 6,378 Km. The density of ice is 918kgm-3 and that of sea water is 1,030kgm-3.An iceberg floats with a portion 224 liters outside water. Find the volume of iceberg. What are the laws of flotation? Give some illustrations.